JR Putman heating and air needed a new digital strategy to increase lead generation in three categories- Heating and Air conditioning, Insulation, and Solar. In combination with producing their radio and TV campaign, jingle and annual media buy for them, we got to work with our smart reach partners building their digital strategy. Expert SEM with our Smart Reach Digital Team. Our Live Chat LEAD GEN tool dramatically increased online leads, and continues to grow each month! 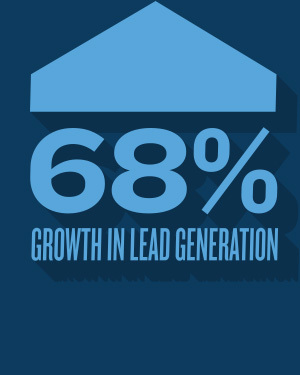 Within the first 30 days lead generation from the website was up 68% and by month three the verifiable digital leads were literally through the roof! Using SGM Advertising and our Smart Reach digital team, radio ads were creating Top of Mind awareness, SEM with Google was putting the brand's ads in front of thousands of consumers who had intent to use their service, and our exclusive LIVE CHAT product on their website was capturing significantly more leads than the standard "contact form" for service, thanks to live interaction with a chat host available 24/7 on their site. We simply won't talk to anyone else but Steve regarding our marketing. Our radio and digital advertising under Steve's guidance has propelled us to quadruple our annual gross sales numbers from when he started. Steve and his team have given us strong measurable success in lead generation, and highly successful branding with our MOM APPROVED campaigns and catchy Jingle. Our SEM, Live chat leads and ad clicks are off the chart successful. We continue to grow month after month and are buying new trucks! If you are lucky enough to get a meeting with Steve, take it! He has proven year after year to be a true marketing wizard and a tireless asset to our company. SGM Advertising knows Digital Marketing. At SGM Advertising we do it all- the big hammer of traditional media like Radio and the digital marketing you need to compete in today’s world.. We’ve partnered with Smart Reach to offer you only the most effective, proven digital marketing products to increase your digital presence lead generation. With our process, your creative team talks to your digital team so the ad content and offers are consistent across all marketing channels. And with one point of contact for everything - your world just got a little easier.